From day one, minute one, there has been no problems with Jenny wearing Soft Paws.It may not be true, but it does seem like when she is missing one Soft Paw she has a way of walking/limping that draws attention to the paw missing the Soft Paw. She is so cute, like she is trying to say "Mama, fix it please". 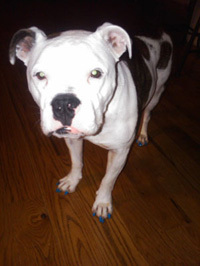 I recently moved into a new home and my beloved American Bulldog Sammy was already, after several days, marking up my new hardwood floors. My husband and I agreed that if we could not come up with a solution that we would have to give him away to a new home. I tried putting socks on him, which of course slipped off. I bought doggy boots which he also managed to get off after only minutes. I was truly giving up hope when I did some internet research and found your website. I was skeptical but willing to try anything to keep Sammy. To my delight the caps stayed on his nails for roughly 6 or 7 weeks (until they started to grow off and wear down from him running outside on the concrete). I have not had to worry about my floors since I put them on him. I just replaced the caps today for the first time and I am so excited to tell you that I get to keep my Sammy and my beautiful hardwood floors are still scratch free! I will endorse this product any day! Thank you for saving us! Soft Paws are a wonderful, safe option for pet lovers who are torn between their furry family member and the preservation of their homes! Thank you Soft Paws! 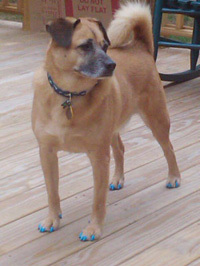 Our dog Joey no longer scratches the furniture and our arms and legs AND he is the most stylish dog on the block sporting his blue Soft Paws! 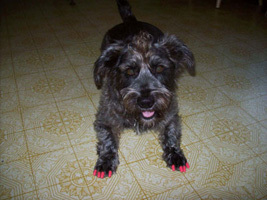 Joey hates to have anyone touch his paws but I was easily able to apply these and he hasn't torn them off yet! Couldn't ask for more. Best product I have seen. 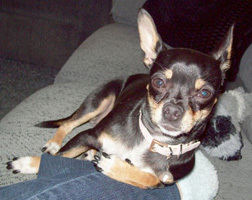 We love to play with Mary Jane but my husband has thin skin and she would always make him bleed an he could not play with her, but with the Soft Paws they are able to play and they are both loving your product. Thanks you! Everyone always thinks that Mokey is a boy. 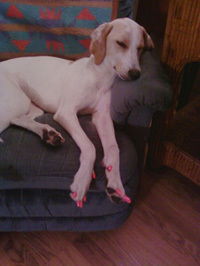 So I got her pink Soft Paws for a girlie fashion statement. I didn't know if she would put up with them, but we have had no trouble putting them on or keeping them on.